Rising flood waters in various Malaysian states forced thousands of residents to evacuate on Tuesday. MALAYSIA: Floods in Malaysia's Pahang state forced more than 5,000 people in four districts to evacuate on Tuesday morning. Meanwhile, 1,035 residents temporarily took shelter at evacuation centres as flood waters rose in Johor state. Mersing police chief DSP Zulkifli Hashim said the victims were from 16 villages in the district. Zulkifli said rain and the rising tide had caused the water level to rise to 3.3 metres on Monday night. He said some roads could only be accessed by heavy duty vehicles. Zulkifli added the district operations room was monitoring the situation while the rescue team involving various agencies were evacuating the residents to safer ground. In Terengganu, 20 residents were also moved from their low-lying residence to three evacuation centres. "t is the southern tip of the tongue which is utterly devastated. Draw a line just north of the Malaysia border and over the top of Borneo. The land on the tongue from this point south will double its elevation loss, so that Java and the islands bordering the Banda Sea will find they have lost a full 80 feet in elevation, sinking many coastal cities and small islands out of sight. Singapore will be awash, its streets hopelessly inundated. Vast areas of the northern coastline of Sumatra and the southern coastline of Borneo will likewise be inundated." 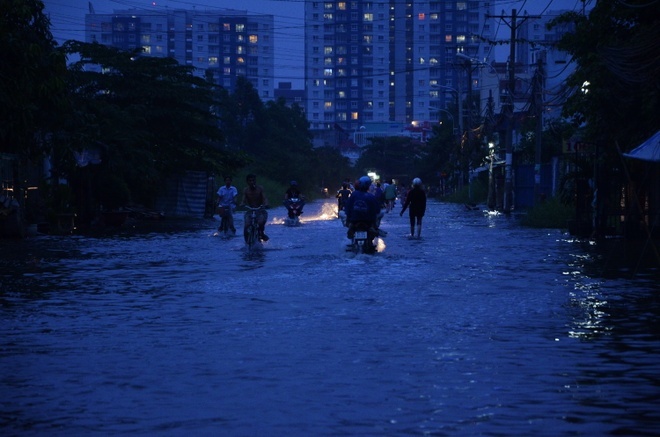 BANGKOK, 5 December 2013 (NNT) - Floods in Thailand’s South have intensified with heavy rains lashing towns and water levels rising. 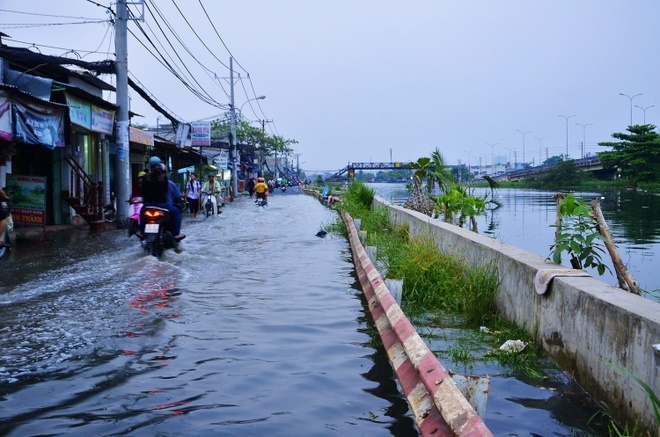 Forecasts from the Meteorological Department indicated that the northeast monsoon continues to rage, bringing torrential rains to provinces on the east coast of the South which include Nakhon Si Thammarat, Phatthalung, Songkhla, Pattani, Yala and Narathiwat. The department advised that all shipping should proceed with caution due to rising tides at this time. Several cargo ships and fishing boats have reportedly been caught in rough winds and had to be docked near smaller islands off the coast of Songkhla as a temporary shelter. They are to maneuver back to the shore once the winds have died down. 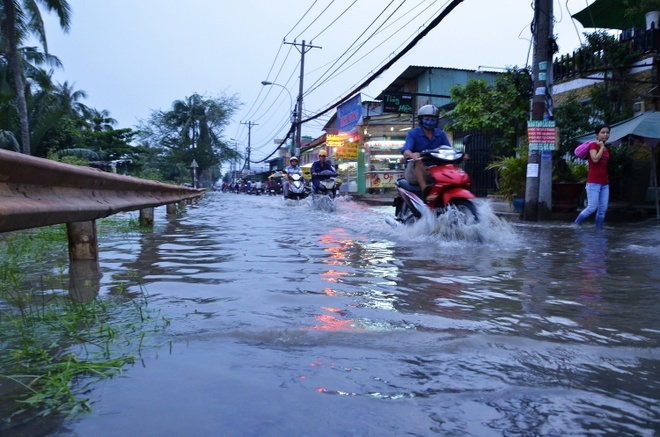 Continuous heavy rains have also submerged five districts of Songkhla and rendered roads impassable to small vehicles. Water has been flowing down from nearby mountain ranges to Mueang district and affected approximately 16,500 households. Agricultural lands in Phatthalung have been damaged by forest runoff which sent residents fleeing to higher ground. 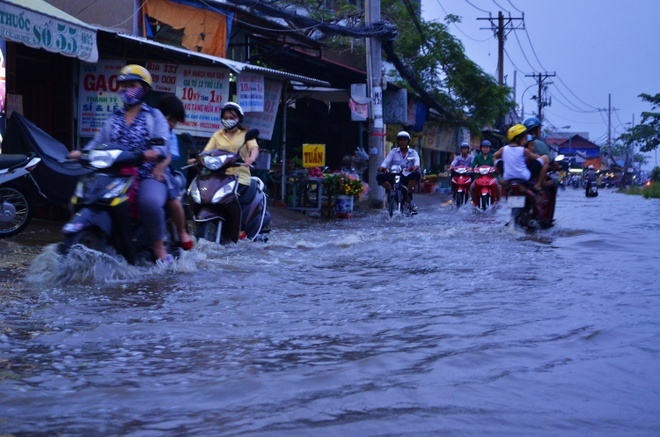 The local disaster prevention unit warned that another wave of floods is expected during the next few days and residents living in low-lying areas are advised to closely follow weather updates. KUALA LUMPUR, Dec 5 — Severe flooding in Malaysia has left a second person dead and two missing, while the number of evacuees has risen to some 56,000, a report and officials said Thursday. More than 38,000 people sought refuge in evacuation centres in the east coast state of Pahang alone, where heavy rain since Sunday has caused the heaviest flooding, the state news agency Bernama reported. Some 18,000 people have been evacuated in Terengganu, Kelantan and Johor states, all along the east coast. For those from the west coast, floods are something that happen rarely. It is quite difficult for them to fathom why people in the east coast are willing to face the same problem again and again. Rising floodwaters cut off water, food, electricity supplies, forcing evacuees to seek shelter in overcrowded relief centres. Thanks Kojima and Sourabh Kale !! To safe ground: A villager carrying a kid to safety in Kuantan. PETALING JAYA: The floods have worsened in Johor, Pahang, Terengganu and Kelantan, with no quick reprieve in sight due to the high tide and rough seas, warned the Meteorological Department. Insufficient drainage infrastructure is compounding the situation, according to the Drainage and Irrigation Department. Pahang is the worst hit, with almost 20,000 people evacuated to 73 relief centres in five districts as of 5pm yesterday. A spokesman of the state flood operations centre said Kuantan alone had more than 12,000 people at 46 relief centres. Water and electricity supplies were cut off in most areas in Kuantan yesterday after several substations were hit by floods and roads in the city were inundated by up to 1m of water. Minister in the Prime Minister’s Department Datuk Seri Shahidan Kassim, who is in charge of the National Security Council, told the Dewan Rakyat that rescue operations went into full swing on Tuesday. Helping hand: Army personnel helping to evacuate victims who were stranded during the flooding in Kampung Sungai Isap in Kuantan. “A helicopter was dispatched to Kuantan to help in operations and I will be heading there myself later today (Wednesday),” he said. 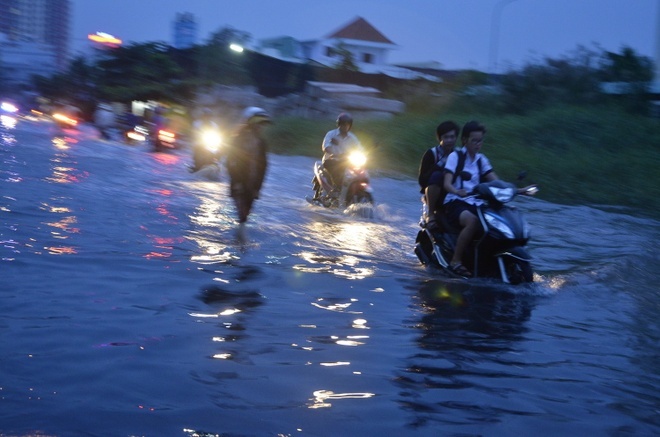 Although rainfall is expected to lessen in the four states, the National Weather Forecast Centre of the Meteorological Department said yesterday it would take a few days for the flood waters to subside as the tide was now at its peak of about 4.5m high. On Tuesday, the Meteorological Department issued a Level 2 orange warning for five areas in Pahang and Terengganu due to heavy rains. Yesterday, the orange warning was extended to eight towns in three states – Kuantan, Rompin, Pekan and Maran (in Pahang), Dungun, Kemaman and Hulu Terengganu (Terengganu) and Kuala Krai (Kelantan). The yellow warning, which is a weather alert to make people aware of the situation and take preventive action, was issued to 17 other areas, including Hulu Perak on the west coast. The orange status is to warn those in affected areas to prepare to act if the situation worsens while the red status, which is the highest alert, is a warning for severe weather and to take immediate action. These warnings, issued by the Meteorological Department, are only based on the rainfall pattern and not on the level of flooding. Although Johor is still seeing worsening floods, the orange alert for the state has been lifted as rainfall has lessened. The DID’s river basin and coastal management division director Datuk Lim Chow Hock said uncontrolled land clearing and rapid development were the reasons the floods seemed to be getting worse every year. “The land cleared for housing and commercial purposes increases every year. Unfortunately, the development of drainage infrastructure is not able to keep up to that pace,” he said. Floods in Malaysia caused by heavy rains have left a teenager dead and forced authorities to evacuate thousands of people, officials said Wednesday. 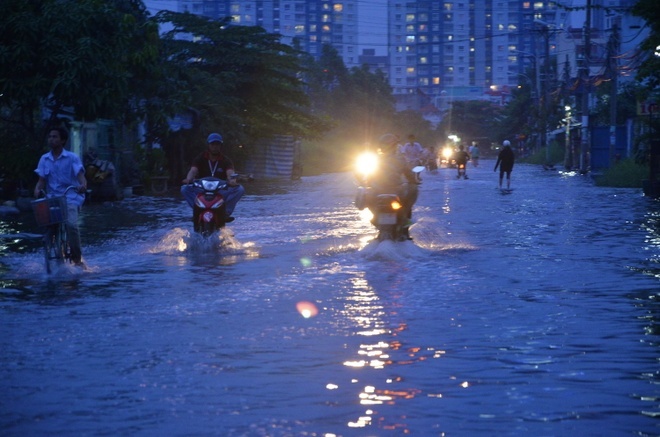 KUALA LUMPUR: Floods in Malaysia caused by heavy rains have left a teenager dead and forced authorities to evacuate thousands of people, officials said Wednesday. Some 19,000 people have been relocated to evacuation centres set up in schools in the east coast states of Pahang and Terengganu and Johor in the south, an official and news reports said. A 17-year-old boy who was fishing with his father in Terengganu drowned after being swept away in a swollen river, a state police official said. A Meteorological Department official said river levels continued to rise due to the high tide and water being released from dams, but the body expected rain to ease in the flood-hit areas. "It's still raining today, but we expect the rain to stop by tomorrow," he told AFP. "Then the situation will improve." The department issued an "orange" alert for Pahang and Terengganu on Monday, warning residents to be prepared for a possible evacuation. 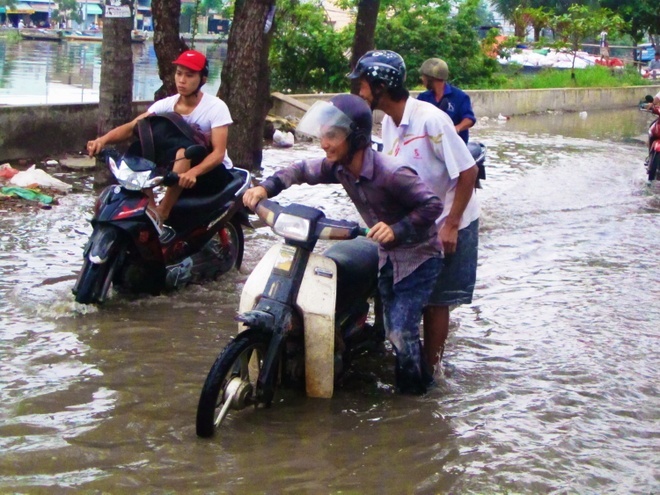 Floods caused by annual monsoon rains that begin around November are common in the Southeast Asian country. 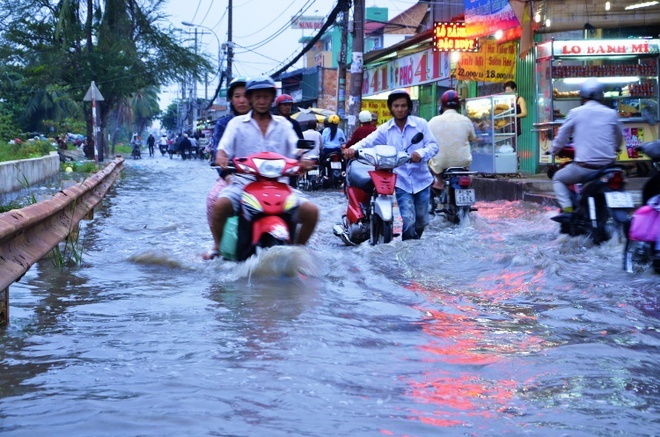 On the evening of 3/12, the Saigon continues to cope with high tides. Too much water on the road wheels. 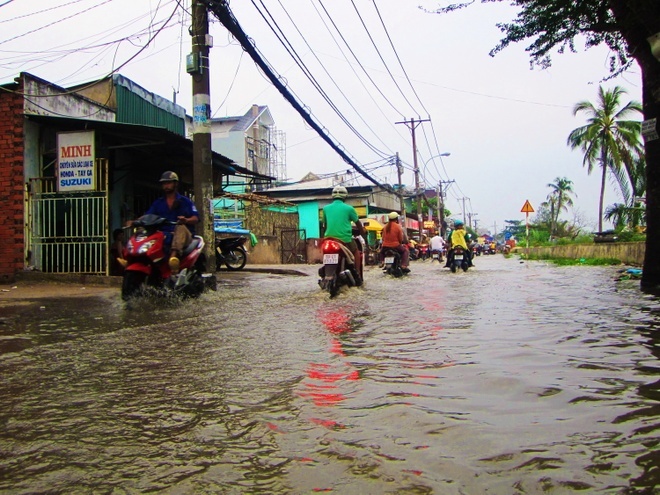 Tomorrow's forecast high tides will rise above alert level 3, reaching 1.61 m.
Ben Phu Dinh Street, District 8 continues to be encroaching tide. Many flood stage water wheel machine. People who control the means of not knowing the road side and in the middle of the road "death pits" or not? The city's population continues to pump water swim home. Many car engine died when passing through flooded roads. Workers dustpan people pushing carts up in the water. 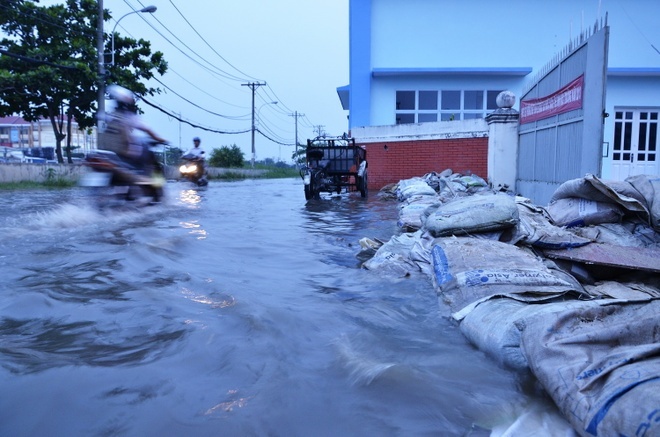 Use the sandbags on water shielding a company on Ben Phu Dinh. 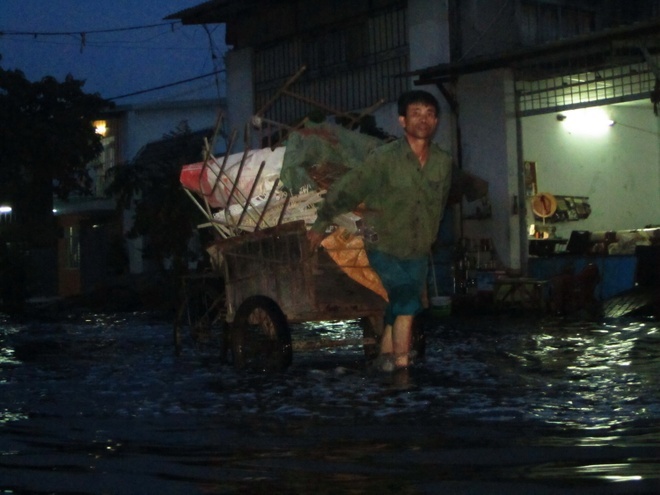 In the evening, many people still struggle to cross flooded roads. Tomorrow's forecast high tides will rise above alert level 3, reaching 1.61 m.